The saying “blind as a bat”, simply isn’t correct. The truth is that all 1,100 bat species can see and often their vision is pretty good, although not as excellent as many other night-hunting animals. There are two main groups of bats, which are believed to have evolved independently of each other, but both from a common ancestor. The first group, Megachiroptera, are mostly medium-sized or large bats who eat fruits, nectar, and sometimes small animals or fish. These species have pronounced visual centers and big eyes as they use senses of vision and smell to capture their prey. For example, Flying Foxes are able not only to see well during daylight, but also can see in color. They actually rely on their daylight vision and cannot fly during moonless nights. The second group, Microchiroptera or “micro bats”, are smaller in size and mostly eat insects. These species (about 70% of all bats) use echolocation to navigate and identify the food. There are two types of photoreceptor cells in the retinas of mammals: the cones, for daylight and color vision, and the rods, for night vision. Until recently, micro bats that are nocturnal were believed to have only rods. However, now scientists have proven that despite their poorly developed small eyes, these bats still can see during the day. Even considering mostly nocturnal lifestyle of these bats, they have to be sensitive to changing light levels because this is how they sense when it is night to start hunting. 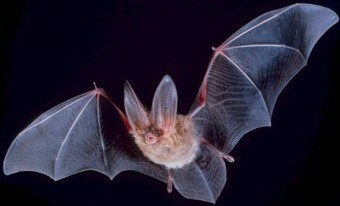 Moreover, vision is used by micro bats to navigate over long distances, beyond the range of echolocation. Otherwise, nocturnal bats guide themselves in the dark using a special sonar system. While flying, bats make high-frequency sounds that bounce off objects and return to the bats as echoes. Bats’ brains then process the auditory information into visual maps, which allow them to “see” in the dark. However, in the daytime or when there is otherwise sufficient light available, they are perfectly capable of using their eyes to see as well. So the truth is, there are no bats which are naturally blind. Some species use their sense of hearing more than their eyes as a matter of adaptation to a particular lifestyle, but their eyes are still functional. During World War II, the US army was developing a project called ‘X-ray’. Bats were trained to carry bombs into cracks of buildings and on the trees in Japanese cities to generate destructive fires. The Free-tailed Bats were selected as they can fly very well with a one-ounce bomb. Because of test problems this project was canceled. Flying Foxes are not wholly nocturnal; they interact and make training flights during the daylight hours. Some bats migrate to warmer climates during the winter, traveling up to 2,400 miles, while others hibernate. Most bats can’t take off from the ground. Instead, these will drop from a hanging position. The largest colony of bats in the world is believed to be in the Bracken Bat Cave, outside of San Antonio, Texas. 20 – 40 million of Mexican Free-tailed Bats inhabit this cave.